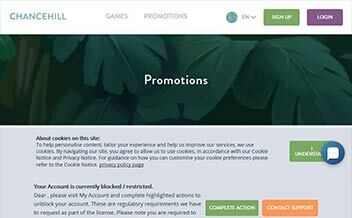 Chance Hill casino is an online casino powered by some of the biggest names in the industry that include NetEnt, Microgaming, Thunderkick, NYX, NextGen Gaming, WMS, Aristocrat, iGaming to go and Play’n Go. 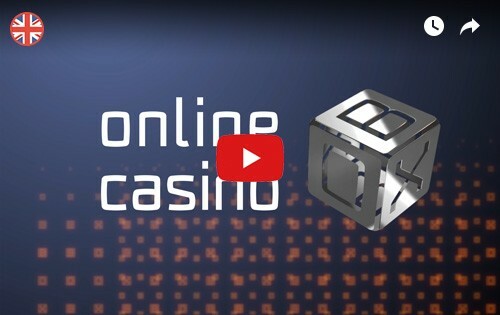 The casino is available in a simple Instant-play format. Chance Hill Casino provides easy navigation of games giving players a virtually real casino experience from the comfort of their homes. Chance Hill Casino, is one of the latest additions to the online casino gaming market having been established in 2015. The casino is charming its way up the ranks to actively compete with the best in the business regarding their product offer. The Casino offers players an amazing experience with its large assortment of slots. 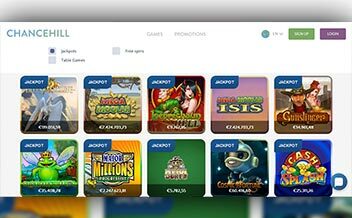 The casino is owned by iGaming Cloud Casinos and licensed by UKGC and Malta.  It protects gamers private details by a128-bit SSL encryption from COMODO. New players at Chance Hill casino enjoy a 100% welcome bonus on their first deposit up to €50. There is a corresponding bonus amount depending on how much a player deposits. It’s free spins galore at Chance Hill casino on weekends on the weekend madness promotion where punters get 15 free spins in The Legend of Shangri-La each time they deposit €10 or more. Players can get up to 75 free spins per day both Saturday and Sunday. There is a selection of Microgaming progressive jackpots on hand, including the impressive Mega Moolah and Major Millions, which have a history of paying off prizes worth millions for punters who want to smash it big. 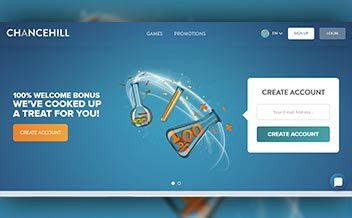 Chance Hill Casino offers punters an enthralling gaming experience in the lobby with its vast selection of slots from multiple software providers. Among them are NetEnt slots like Starburst slot and Neon Staxx slot, Microgaming hits like Mega Moolah slots and The Finer Reels of Life slot. The games are developed to meet the preferences of online gamers. The Casino doesn’t forget the table game fans as well. The different software developers make sure that the Casino has something for every player. Table games are also abundant at Chance Hill Casino. Blackjack players have 6 different variants to choose from; roulette players have 8. There are also several other favorites such as Oasis Poker, Caribbean Poker, Cyberstud Poker, Baccarat, Craps, and more. Chance Hill Casino’;s video poker selection is highly varied with more than 15 different games. Among them are traditional variants like Jacks or Better, Joker Poker, Deuces Wild, and Double Bonus Poker, as well as unique themed games like Wild Texas and Japan Poker. The Chance Hill casino is powered by some of the biggest names in the industry that include NetEnt, Microgaming, Thunderkick, NYX, NextGen Gaming, WMS, Aristocrat, iGaming to go and Play’n Go. Australia, Belarus, Bulgaria, Croatia, Czech Republic, France, Israel, Italy, Latvia, Romania, Slovakia, South Africa, Spain, Ukraine, United States. Maestro, Master Card, Visa, Skrill, Bank Wire Transfer, Trustly, Neteller and, Euteller. British pounds Sterling, Norwegian Kroner, Swedish kronor, Euros, Australian dollars, and Canadian dollars. Chance Hill Casino runs on various browsers such as Mozilla and Chrome. The Casino is also available in instant play. 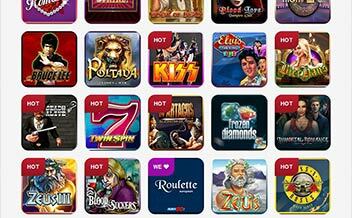 Chance Hill Casino has made a great start and has a smart and stylish web design. Beyond this, they have proven themselves to be open to feedback, which is a very good position to start from. The only set back is the lack of a 24-hour live chat; otherwise, punters should find almost everything they want at the casino.